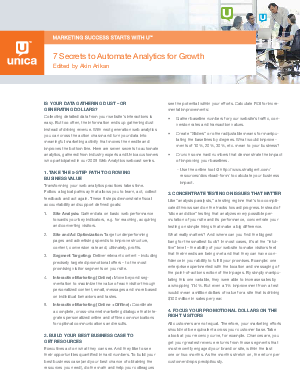 Download 7 Secrets to Automate Analytics for Growth to reveal extraordinary opportunities to improve customer satisfaction, drive sales and increase profits. Gathered by acclaimed web analytics guru Akin Arikan and industry experts, these seven secrets reveal extraordinary opportunities to turn your data into meaningful marketing activity that moves the needle and improves the bottom line. Register now to unlock the seven secrets and ensure your interaction data is driving revenue.